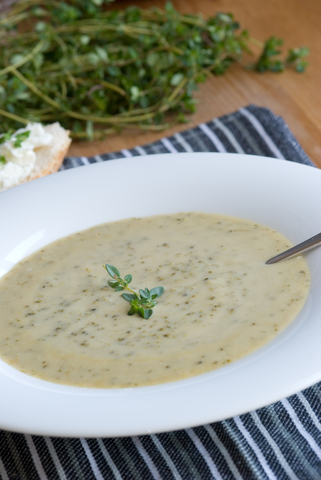 Indulge yourself with this delicious Broccoli and Stilton soup. As some of you may know by now, I love to cook delicious yet healthy and low-fat soups. This soup does not qualify for the lowest in fat ever but the calories are definitely worth it! The Stilton cheese gives the soup such a rich flavour but is not overpowering and somehow brings out the best of the broccoli too. If you can’t find Stilton cheese, free to buy another blue cheese instead. Heat the olive oil on medium heat in your stockpot. Sauté the onions and when they are about done add the garlic and the teaspoon of dried thyme. Once translucent add the roughly chopped broccoli, celery pieces and diced potato. Stir gently, then cover with a lid and allow to sweat for 5 – 10 minutes. Pour in your stock and bring to boil. Once boiling reduce the heat and simmer for 15 minutes or until the vegetables are tender. Turn off the heat and let the soup cool down for a few minutes. Then purée the ingredients with a hand blender in the stockpot or puree in batches in your blender. Return the soup to a clean pan and stir in the crumbled Stilton cheese. I like to serve the soup when the cheese has not completely dissolved yet but if you do, you can always use a hand blender for a few seconds. Season the soup with some freshly ground pepper and serve with a warm and crusty piece of bread.